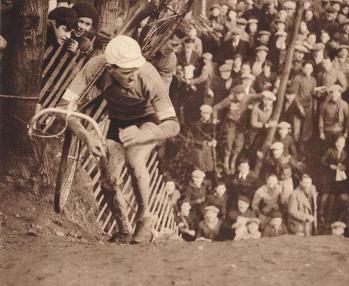 The first Cyclocross National Championships were run in France in 1902. Belgium organized their first championship 8 years later in 1910. Then others followed: Switzerland (1912), Luxembourg (1923), Spain (1929) and Italy (1930). The first competitions were more what a mountain bike rally is today. They would consist of leaving one point and arriving at another, after crossing fields, forests, hills and rivers. The first important major international event of cyclocross was called the “Criterium International.” It first took place in 1924 and was organized in a forest west of Paris. The race was in a rural area and attracted great enthusiasm from the public. Year after year the competition continued and became increasingly popular. Slowly cyclocross was developing a style of its own and promoters searched for shorter circuits to facilitate spectator's overall vision. Driven by this popularity they looked to central areas of cities, where the courses were characterized by long sections of stairs, paved streets, gardens and small fences (or barriers) similar to the ones utilized today. As the development progressed, the “ Criterium International de Cyclo-Cross ” (the unofficial World Championships, not recognized by the UCI) gave way to the UCI's World Professional Cyclo-Cross Championships in 1950. 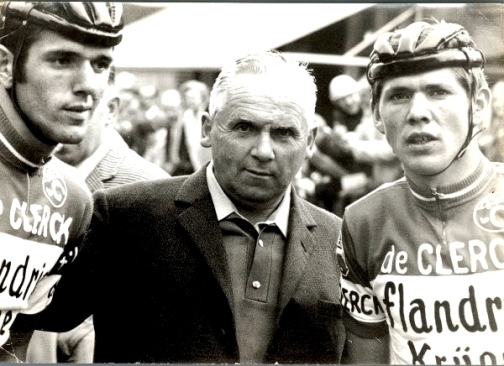 The first official World CC Champion was Jean Robic (Fra). Robic, who in 1947 won the Tour de France. He is still the only TdF champion to win the World CC Championship. After Robic the championships were dominated by long “reigns of champions.” Roger Rondeaux (Fra)- 1951, 52, & 53, Andre Dufraisse (Fra)- 1954, 55, 56, 57, & 58, Renato Longo (Ita) 1959, 62, 64, 65, & 67, Eric de Vlaeminck (Bel)- 7 WC victories in 8 years ( he was the Eddy Merckx of cyclocross ), Albert Zweifel (Sui)- 1976, 77, 78, & 79, Roland Liboton (Bel)- 1980, 80, 82, 83, & 84. 7 World Championships over an 8 year period. CyclingRevealed's Ultimate Top 10 Cyclocross racers of "ALL-TIMES"
Several of the current young superstars will without doubt find a place of the "ALL-TIMES" list. But until they survive the rigors of time they will be ranked for what they have achieved in their short careers. CyclingRevealed will examine the CX issue again in the future. Your opinion is important. The history of Cyclocross racing is new to CyclingRevealed and my selection of the ALL-TIME Top 10 may be subject to adjustment. To all our historian readers please email us with your opinion. Who should higher? Who should be lower? or Who should be on or off the list? Thanks to Stu Thorne from CyclocrossWorld.com for advice on the Top 10 ranking.